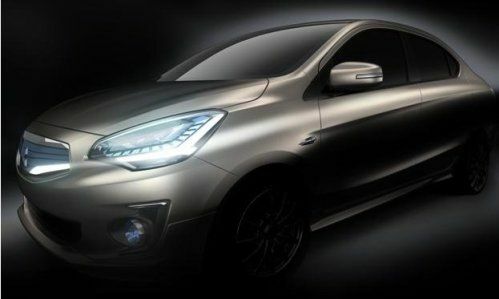 When the 2013 Bangkok Motor Show opens later this month, among the big debuts will be the new Mitsubishi Concept G4 – a compact sedan that could preview the next generation of the Mitsubishi Lancer and the high performance Lancer-based Evolution. We should begin by saying that the new Mitsubishi Concept G4 is not referred to as being the next generation Lancer or Lancer Evolution anywhere in today’s brief press release but it is slated to be the next Mitsubishi global compact car. Right now, Mitsubishi’s global compact sedan is the Lancer and from that platform comes the high performance Lancer Evolution so if the Concept G4 is going to fill the slot of the Lancer (whether or not it carries the Lancer name), the next generation Evolution could also be based on the sporty Concept G4 sedan shown on the right. Regardless of what vehicle the Mitsubishi Concept G4 previews, this is a great looking compact sedan with a look unlike anything that we have seen from the Mitsu lineup here in the United States. Amidst rumors that the company was going to an all-EV lineup in the not so distant future, the Japanese automaker was quick to state that the Evolution is here to stay and with the controversy around the exterior design of the current Lancer and Evo – this new look could help attract new buyers who don’t care for the aggressive front end of the current Lancer lineup. We can only see so much but from what we can see across the front end with a new 6 sided diamond shaped grille, angular new LED headlights and what looks to be a fairly aggressive lower front fascia that extends out away from the front end to create a natural “splitter” design. In addition to showing off the front end and side profile in this shadowy teaser of the Mitsubishi Concept G4, the Japanese automaker has promised a lightweight chassis that will offer “agile and pleasing driving dynamics”. The company talks about the short nose and the slippery aerodynamics of the G4 which will work with the light weight nature of the car to bolster the fun to drive angle of the next Mitsubishi compact sedan. However, the company also talks about a new 1.2L MIVEC 4-cylinder engine mated to a CVT transmission – features which are most certainly NOT the stuff that future Evo dreams are made of. However, considering the stark difference between the drivetrain in the current Lancer and the high performance Evolution models illustrates that the drivetrain of the base Lancer may not have any influence on what powers the Evo XI. We have some time before the start of the Bangkok Motor Show so we very well could see more shots of the Mitsubishi Concept G4 ahead of the Thai show. The 34th Bangkok International Motor Show opens on March 25 and runs through April 7. The odds are good that some of you are questioning Mitsubishi’s decision to use Bangkok as the debut location for a car that is important on global auto scene as their compact sedan. You are very right in thinking that but considering the poor state of the Mitsubishi brand here in the United States, the Japanese automaker may be focusing on markets where their products are more popular in relation to the rest of the local industry. That makes sense but considering the fact that Mitsubishi didn’t bother to put together a display at the Detroit Auto Show makes you wonder just how much concern the company has for their North American branch.